Happy New Year everyone! 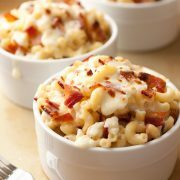 Nothing like ringing in the new year with a new and exciting twist on mac and cheese. 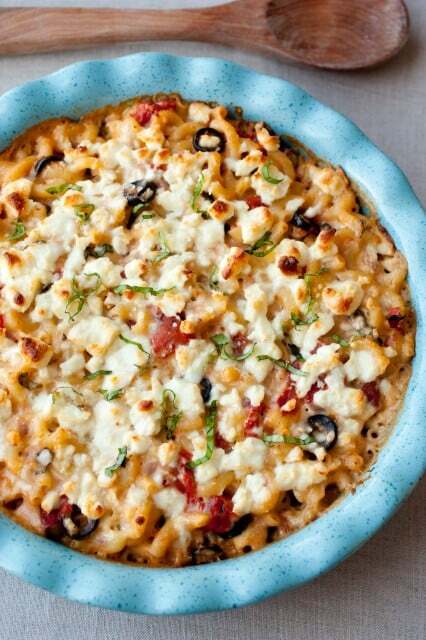 I love the flavors of the Mediterranean and this simple macaroni dish combines so many of them deliciously together. This is not your ordinary sharp cheddar macaroni and cheese. 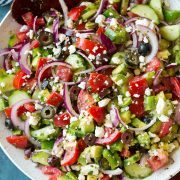 This is loaded with feta cheese, fire roasted tomatoes, red onions, olives, zesty herbs and of course it must have garlic and olive oil. It was hard for me to stop eating this once I started. 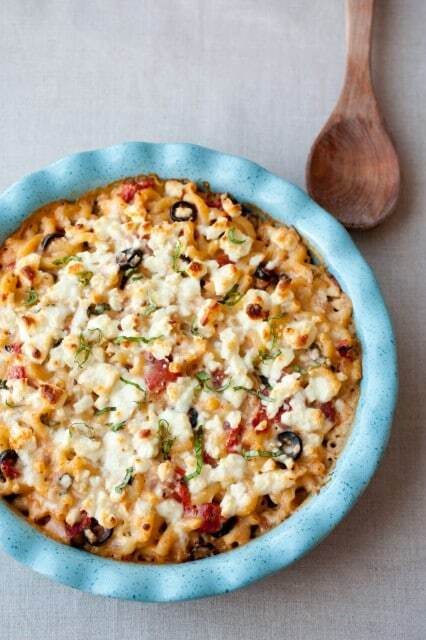 This creamy Mediterranean Macaroni and Cheese is a fabulous addition to add to your dinner rotation. 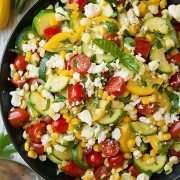 With it’s simplicity, unique spin and incredible flavor this dish is definitely set to impress. Enjoy! 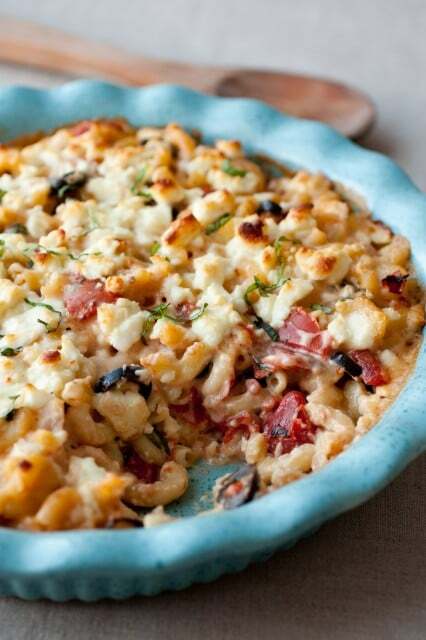 A delicious Mediterranean take on the classic mac and cheese! Preheat oven to 400 degrees. Butter an 8 by 8-inch baking dish or a 9-inch deep dish pie dish, set aside. In a small mixing bowl, combine drained diced tomatoes, chopped olives, 1 Tbsp fresh basil and dried oregano, set aside. Boil pasta to al dente according to directions listed on package. Drain pasta well and return to pot. Meanwhile, melt butter along with olive oil in a medium saucepan over medium heat. Once hot, add onion and saute until soft and lightly golden, about 3 - 4 minutes, adding in garlic during the last minute of sauteing. Whisk in flour, and cook stirring constantly for 1 minute. While whisking vigorously, slowly pour in milk and bring mixture just to a boil, stirring constantly. Once mixture reaches a boil reduce heat to medium-low and simmer, stirring constantly until mixture has thickened, about 3 minutes. Remove from heat, stir in 2 oz feta cheese and mozzarella cheese then season with salt and pepper to taste. Pour tomato mixture over well drained pasta in pot and toss, then pour sauce over pasta mixture and toss to evenly coat. Pour coated pasta mixture into prepared baking dish. 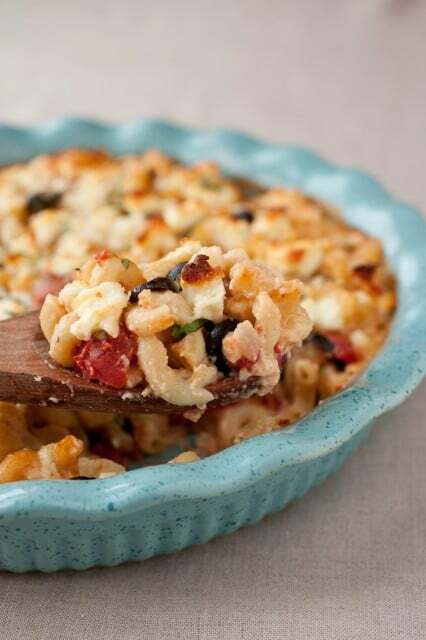 Sprinkle top evenly with remaining 4 oz crumbled feta cheese. Bake in preheated oven 20 - 25 minutes until edges are bubbling and top is golden brown. Serve warm garnished with fresh basil ribbons if desired. Grace: I roasted some red bell peppers along with roasting the tomatoes – just put them back in again for 20 minutes after taking out tomatoes. Also added thyme to the spice mix.